Not to be confused with: Ion Television or Ion implantation. Ion channels are pore-forming membrane proteins whose functions include establishing a resting membrane potential, shaping action potentials and other electrical signals by gating the flow of ions across the cell membrane, controlling the flow of ions across secretory and epithelial cells, and regulating cell volume. Ion channels are present in the membranes of all cells. Ion channels are considered to be one of the two traditional classes of ionophoric proteins, with the other class known as ion transporters (including the sodium-potassium pump, sodium-calcium exchanger, and sodium-glucose transport proteins, amongst others). Study of ion channels (channelomics) often includes biophysics, electrophysiology and pharmacology, utilizing techniques including voltage clamp, patch clamp, immunohistochemistry, X-ray fluorescence, and RT-PCR. Ion channels are located within the plasma membrane of nearly all cells and many intracellular selective permeability. The archetypal channel pore is just one or two atoms wide at its narrowest point and is selective for specific species of ion, such as sodium or potassium. However, some channels may be permeable to the passage of more than one type of ion, typically sharing a common charge: positive (cations) or negative (anions). Ions often move through the segments of the channel pore in single file nearly as quickly as the ions move through free solution. In many ion channels, passage through the pore is governed by a "gate", which may be opened or closed in response to chemical or electrical signals, temperature, or mechanical force. Because channels underlie the cardiac, skeletal, and smooth muscle contraction, epithelial transport of nutrients and ions, T-cell activation and pancreatic beta-cell insulin release. In the search for new drugs, ion channels are a frequent target. There are over 300 types of ion channels in a living cell. Ion channels may be classified by the nature of their gating, the species of ions passing through those gates, the number of gates (pores) and localization of proteins. Also known as ionotropic receptors, this group of channels open in response to specific ligand molecules binding to the extracellular domain of the receptor protein. Ligand binding causes a conformational change in the structure of the channel protein that ultimately leads to the opening of the channel gate and subsequent ion flux across the plasma membrane. Examples of such channels include the cation-permeable "nicotinic" Acetylcholine receptor, ionotropic glutamate-gated receptors and ATP-gated P2X receptors, and the anion-permeable γ-aminobutyric acid-gated GABAA receptor. Other gating include activation/inactivation by e.g. second messengers from the inside of the cell membrane, rather as from outside, as in the case for ligands. Ions may count to such second messengers, and then causes direct activation, rather than indirect, as in the case were the electric potential of ions cause activation/inactivation of voltage-gated ion channels. Inward-rectifier potassium channels: These channels allow potassium to flow into the cell in an inwardly rectifying manner, i.e., potassium flows effectively into, but not out of, the cell. This family is composed of 15 official and 1 unofficial members and is further subdivided into 7 subfamilies based on homology. These channels are affected by intracellular ATP, PIP2, and G-protein βγ subunits. They are involved in important physiological processes such as the pacemaker activity in the heart, insulin release, and potassium uptake in glial cells. They contain only two transmembrane segments, corresponding to the core pore-forming segments of the KV and KCa channels. Their α subunits form tetramers. Temperature Gated Channels: Members of the Transient Receptor Potential ion channel superfamily, such as TRPV1 or TRPM8 are opened either by hot or cold temperatures. Chloride channels: This superfamily of poorly understood channels consists of approximately 13 members. They include ClCs, CLICs, Bestrophins and CFTRs. These channels are non-selective for small anions; however chloride is the most abundant anion, and hence they are known as chloride channels. There are other types of ion channel classifications that are based on less normal characteristics, e.g. multiple pores and transient potentials. Two-pore channels: This small family of 2 members putatively forms cation-selective ion channels. They are predicted to contain two KV-style six-transmembrane domains, suggesting they form a dimer in the membrane. These channels are related to catsper channels channels and, more distantly, TRP channels. Transient receptor potential channels: This group of channels, normally referred to simply as TRP channels, is named after their role in Drosophila phototransduction. This family, containing at least 28 members, is incredibly diverse in its method of activation. Some TRP channels seem to be constitutively open, while others are gated by voltage, intracellular Ca2+, pH, redox state, osmolarity, and mechanical stretch. These channels also vary according to the ion(s) they pass, some being selective for Ca2+ while others are less selective, acting as cation channels. This family is subdivided into 6 subfamilies based on homology: canonical (TRPC), vanilloid receptors (TRPV), melastatin (TRPM), polycystins (TRPP), mucolipins (TRPML), and ankyrin transmembrane protein 1 (TRPA). Channels differ with respect to the ion they let pass (for example, Na+, K+, Cl−), the ways in which they may be regulated, the number of subunits of which they are composed and other aspects of structure. Channels belonging to the largest class, which includes the voltage-gated channels that underlie the nerve impulse, consists of four subunits with six transmembrane helices each. 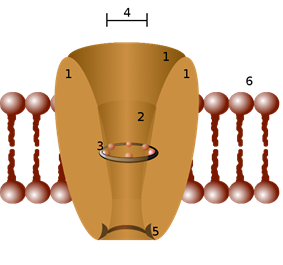 On activation, these helices move about and open the pore. Two of these six helices are separated by a loop that lines the pore and is the primary determinant of ion selectivity and conductance in this channel class and some others. The existence and mechanism for ion selectivity was first postulated in the 1960s by Clay Armstrong. He suggested that the pore lining could efficiently replace the water molecules that normally shield potassium ions, but that sodium ions were too small to allow such shielding, and therefore could not pass through. This mechanism was finally confirmed when the structure of the channel was elucidated. The channel subunits of one such other class, for example, consist of just this "P" loop and two transmembrane helices. The determination of their molecular structure by Roderick MacKinnon using X-ray crystallography won a share of the 2003 Nobel Prize in Chemistry. Saxitoxin, is produced by a dinoflagellate also known as "red tide". It blocks voltage dependent sodium channels. Conotoxin, is used by cone snails to hunt prey. There are a number of genetic disorders which disrupt normal functioning of ion channels and have disastrous consequences for the organism. Genetic disorders of ion channels and their modifiers are known as channelopathies. See Category:Channelopathy for a full list. Equine hyperkalaemic periodic paralysis as well as Human hyperkalaemic periodic paralysis (HyperPP) are caused by a defect in voltage dependent sodium channels. Mutations in and overexpression of ion channels are important events in cancer cells. In Glioblastoma Multiforme upregulation of gBK potassium channels and ClC-3 chloride channels enables glioblastoma cells to migrate within the brain, which may lead to the diffuse growth patterns of these tumors. The Nobel Prize in Chemistry for 2003 was awarded to two American scientists: Roderick MacKinnon for his studies on the physico-chemical properties of ion channel structure and function, including x-ray crystallographic structure studies, and Peter Agre for his similar work on aquaporins. 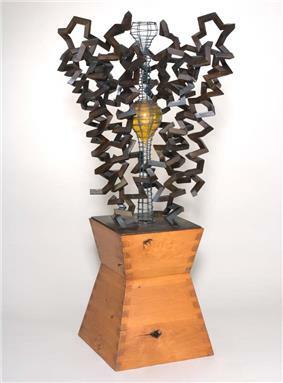 Roderick MacKinnon commissioned Birth of an Idea, a tall sculpture based on the KcsA potassium channel. The artwork contains a wire object representing the channel's interior with a blown glass object representing the main cavity of the channel structure. ^ Hille, Bertil (2001) . Ion Channels of Excitable Membranes (3rd ed.). Sunderland, Mass: Sinauer Associates, Inc. p. 5. ^ Hille, Bertil (1984). Ionic Channels of Excitable Membranes. ^ Purves, (2001). "Chapter 4: Channels and Transporters". In Dale Purves, George J. Augustine, David Fitzpatrick, Lawrence. C. Katz, Anthony-Samuel LaMantia, James O. McNamara, S. Mark Williams, editors. Neuroscience (2nd ed.). Sinauer Associates Inc.
^ Hille B, Catterall, WA (1999). "Chapter 6: Electrical Excitability and Ion Channels". In George J Siegel, Bernard W Agranoff, R. W Albers, Stephen K Fisher and Michael D Uhler. Basic neurochemistry: molecular, cellular, and medical aspects. Philadelphia: Lippincott-Raven. ^ Camerino DC, Tricarico D, Desaphy JF (April 2007). "Ion channel pharmacology". Neurotherapeutics 4 (2): 184–98. ^ Verkman AS, Galietta LJ (February 2009). "Chloride channels as drug targets". Nat Rev Drug Discov 8 (2): 153–71. ^ Camerino DC, Desaphy JF, Tricarico D, Pierno S, Liantonio A (2008). "Therapeutic approaches to ion channel diseases". Adv. Genet. Advances in Genetics 64: 81–145. ^ Gabashvili IS, Sokolowski BH, Morton CC, Giersch AB (September 2007). "Ion Channel Gene Expression in the Inner Ear". J. Assoc. Res. Otolaryngol. 8 (3): 305–28. ^ Vicini S (April 1999). "New perspectives in the functional role of GABA(A) channel heterogeneity". Mol. Neurobiol. 19 (2): 97–110. ^ Bezanilla F, Armstrong CM (November 1972). "Negative Conductance Caused by Entry of Sodium and Cesium Ions into the Potassium Channels of Squid Axons". J. Gen. Physiol. 60 (5): 588–608. ^ Jiang Y, Lee A, Chen J, Ruta V, Cadene M, Chait BT, MacKinnon R (May 2003). "X-ray structure of a voltage-dependent K+ channel". Nature 423 (6935): 33–41. ^ The detailed 3D structure of the magnesium channel from bacteria can be seen here . ^ Molenaar, Remco J. (2011). "Ion Channels in Glioblastoma". ISRN Neurology 2011: 1. ^ Pethig R, Kell DB (1987). "The passive electrical properties of biological systems: their significance in physiology, biophysics and biotechnology". Phys. Med. Biol. 32 (8): 933–970. ^ Cole KS, Baker RF (February 1941). "Longitudinal Impedance of the Squid Giant Axon". The Journal of General Physiology (The Rockefeller University Press) 24 (6): 771–88. ^ "The Nobel Prize in Chemistry 2003" (Press release). The Royal Swedish Academy of Science. 2003-10-08. Retrieved 2010-01-18. ^ Ball, Philip (March 2008). "The crucible: Art inspired by science should be more than just a pretty picture". Chemistry World 5 (3): 42–43. Retrieved 2009-01-12.